A wonderful, expert combination of the purest essential oils, this fresh blend exhilarates, provokes, and helps restore your vitality. An ideal gift for those low on energy or motivation, this captivating fragrance is the perfect way to combat fatigue, improve mental alertness, enable you to focus, and elevate your emotional state. Awaken the senses with this zesty fragrance that combines bright citrus top notes with mellow middle notes of warm amber and earthy vetiver, all presented in a stylish natural reed diffuser. The zingy fragrance of grapefruit is audacious, exciting, and vibrant—breathing life into a dull room and energising those who are feeling a little lacklustre. Refresh the spirit, awaken the mind, and invigorate the soul with this sparkling, much-loved aroma that is well-known for its ability to revitalise. The sweet, euphoric scent of juicy tangerine is believed to have a myriad of beneficial properties, such as its ability to relieve stress and anxiety, sedate depression, quell anger, and calm impulsive responses. The addition of vetiver, with its gentle musky scent, is the perfect complement to this addictive blend. This understated aroma adds balance to the overall fragrance and brings with it a range of perceived health benefits—soothing the nerves, relieving anxieties, and dispelling anger. 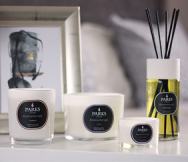 Presented in our iconic black and white branded packaging, the sophisticated 250ml natural reed diffuser, with its sleek design, effectively disperses the uplifting aroma of this stunning blend around the room to deliver long-lasting fragrance. It’s the perfect gift to re-energise a friend or loved one in need of a revitalisation.